Pictured from left to right: Provost and Dean of the College Neil Weissman, Associate Director Information Literacy & Research Services Christine Bombaro '93, Mohala Kaliebe '22, Tra Pham '22, Director of Library Services Eleanor Mitchell, Hoang Vo '22 and Director of the Writing Program Noreen Lape. Photo by Carl Socolow '77. 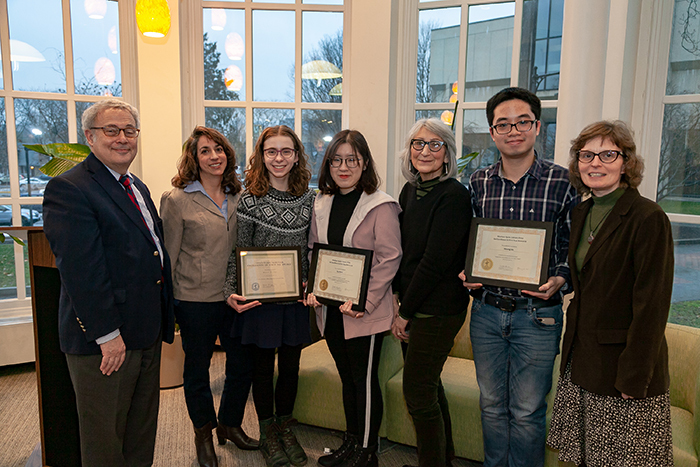 Dickinson recently honored three first-year students for writing and research through the First-Year Seminar Excellence in Writing Awards and the Waidner-Spahr Library Prize for Excellence in First-Year Research. Mohala Kaliebe ’22 earned the First-Year Seminar Excellence in Writing Award with her essay "Strength or Weakness: When to Break the (Grammatical) Rules," and Tra Pham ’22 and Hoang Vo ’22 won prizes for Excellence in First-Year Research for their essays “Why Can’t I Look Like Her: The Impact of Photoshop on Female Adolescents’ Internalization of Beauty and Body-Related Concerns” and “Identity Theft: Is the U.S. Really Safe in the Police’s Hands?” respectively. Now in its ninth year, the First-Year Seminar Excellence in Writing Awards honor up to three first-year students at Dickinson who display mastery of the learning outcomes in first-year writing and information literacy. This year was the first year the Waidner-Spahr Library Prize for Excellence in First-Year Research was presented. The new prize, which is awarded to up to two students each year, honors exceptional projects that effectively use properly cited research material to examine an engaging question. During his First-Year Seminar “From Facebook to Face Time: Living and Learning in Digital Times,” Vo affirmed his interest in computer science and decided to explore how the use of technology affects our daily lives. His research examined the relationship between privacy and security and how knowledge-acquisition agencies collect data on citizens. He argues that the current legal system has failed to effectively prevent citizens from identity theft threats. The First-Year Seminar awards exemplify the strength of the college’s programs for first-year students. These courses introduce students to Dickinson as a “community of inquiry” by developing habits of mind essential to a useful liberal-arts education. Learn more about research at Dickinson.